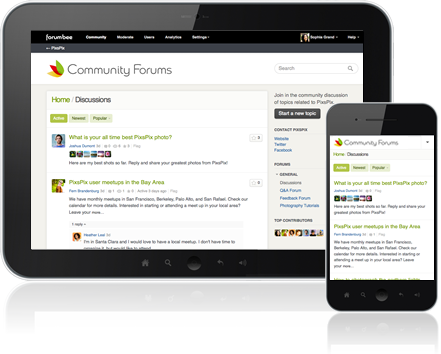 Engage your audience with your own branded social community forums. 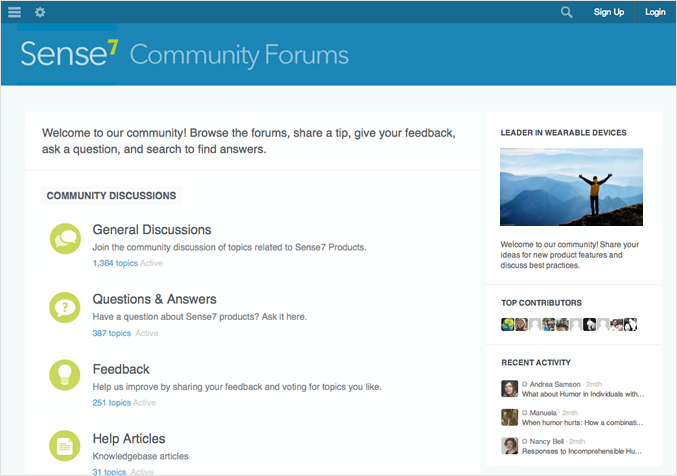 Collect feedback, spark discussions, and benefit from community-powered Q&A forums. 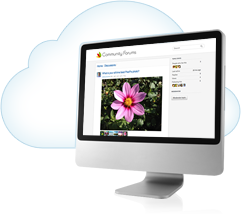 With a simple interface and no software to install, you can have your community ready in minutes. 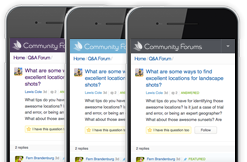 Provide a place for your customers to help each other with a Q&A forum. Customers can post questions and help others by sharing their expertise. You and your employees can also participate, answering questions and featuring the best answers from the community. Members vote for questions they have too, and popular questions bubble to the top. Give your customers a voice to share their ideas and feedback on your products or services. Customers vote for their favorite ideas. 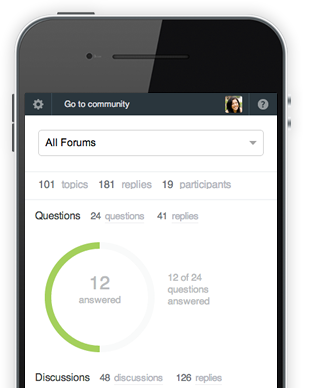 See what is popular and prioritize, then give updates to the community on ideas you are implementing. 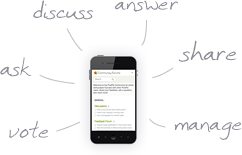 Create a searchable knowledgebase with help and how-to articles. Make your content rich with images and videos. 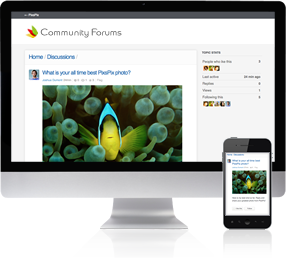 Keep your community up to date with your articles, announcements and blog entries. You are just minutes away from starting your new community! 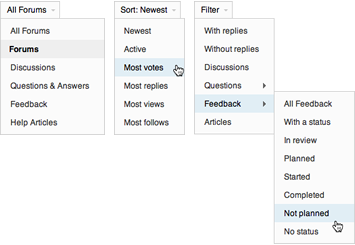 Quickly find topics without replies, questions that haven't been answered, or feedback that does not have a status. 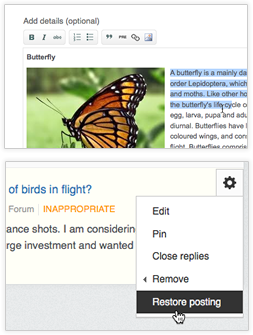 Feature the best comments or answers in a topic or label them as official response. Pinned replies appear at the top of the comments. Get notified about new community activity, even when you are away from your desk. 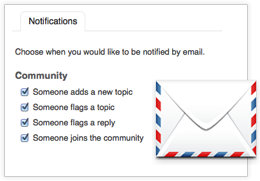 Choose to receive email notifications for different types of events, such as a new topic, flagged topics, or new members joining the community. Customers can share images, photos and videos. 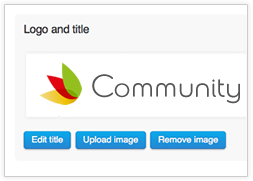 Postings can be formatted as rich text, with inline images and links. Exchanging technical information? 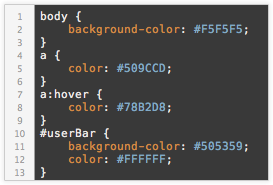 Code snippets are formatted beautifully with syntax coloring and line numbers. Members can drive traffic to interesting content in your community by tweeting or sharing on Facebook. Showing you are listening goes a long way to creating happy customers. 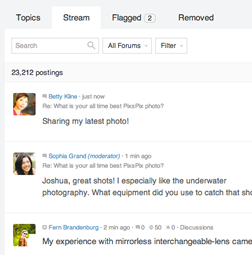 You and your employees can interact and collaborate with customers in threaded discussions. 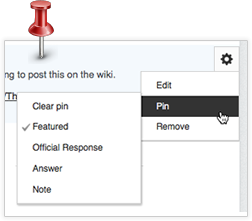 Let customers know you are listening by using status labels such as “In Progress” or “Completed” for their feedback. 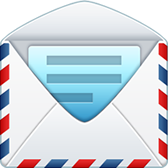 Highlight and feature exceptional customer postings. Personal profiles help members get to know each other and foster community building. 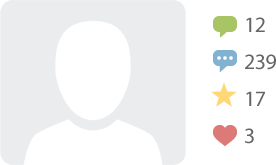 Members customize their profile with their avatar, bio, location and links. 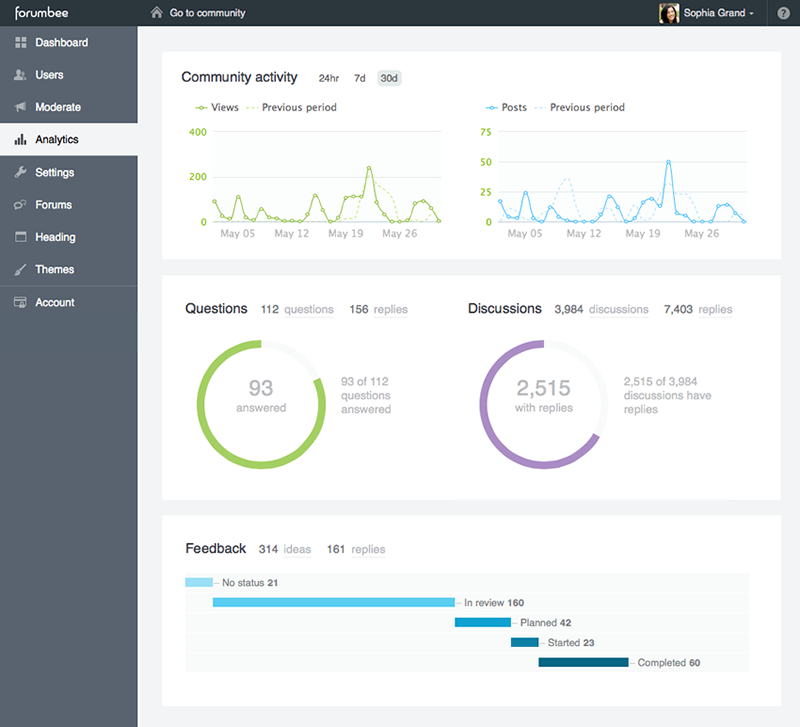 Profiles show the stream of member activity and stats for community response to their postings. 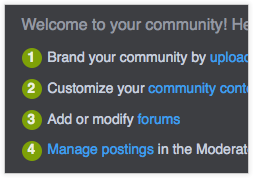 Set up your team of moderators. Manage members of the community. Monitor user activity and control access. 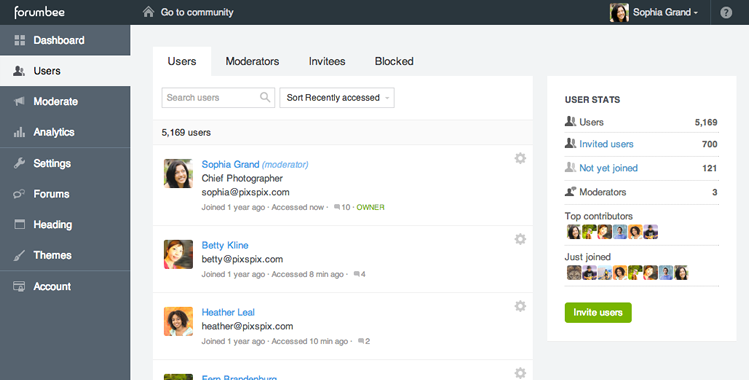 Track new members as they join the community and view their activity. Find out who has most recently visited the community. See who is most engaged and posting actively. 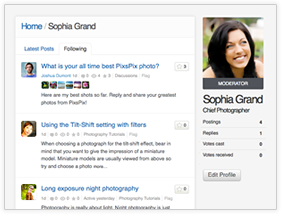 View latest posts by a member and see their popularity stats. Delegate the responsibility of community management to your team of moderators and administrators. They can be employees or trusted members within your community. 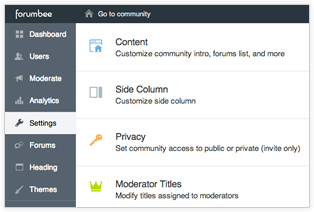 Moderators may manage content, administrators have the added ability to configure community settings. 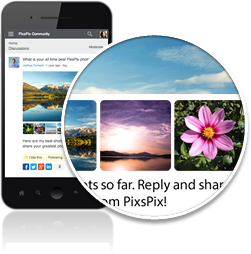 Your logo and all images in your community are delivered in high-resolution to Retina and HD screens, giving your users a brilliant, crisp visual experience. 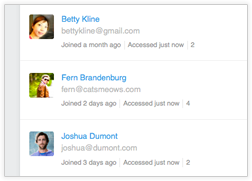 Keep tabs on users as they join, view activity, and control their access. Check community stats on the go. 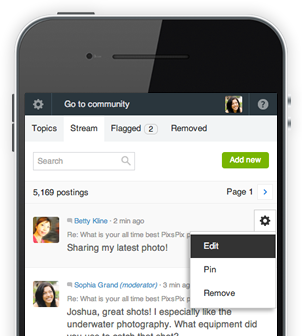 Share community activity in meetings or offsites. 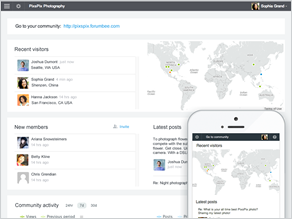 Visually track and measure community activity in real time. 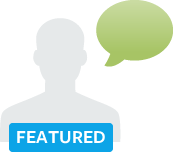 Discover top themes and gain insights from conversations. 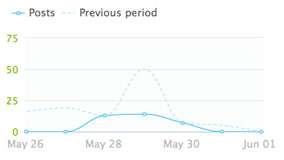 View trends of community page views and postings over time. Zoom into the last 24 hours or expand your view to broader time frames. Gauge overall volume of feedback. Track the number of ideas in each step of your workflow from initial review through completion. Track volume of questions. See how many members are participating. Monitor the number of unanswered questions and compare to the answered rate. 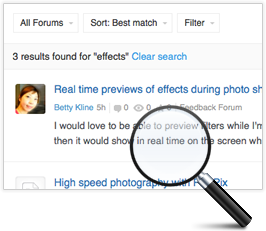 Gain insight into what people are talking about with text analysis. 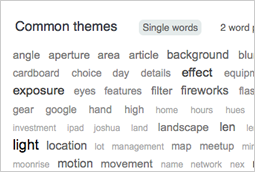 View popular words and phrases. 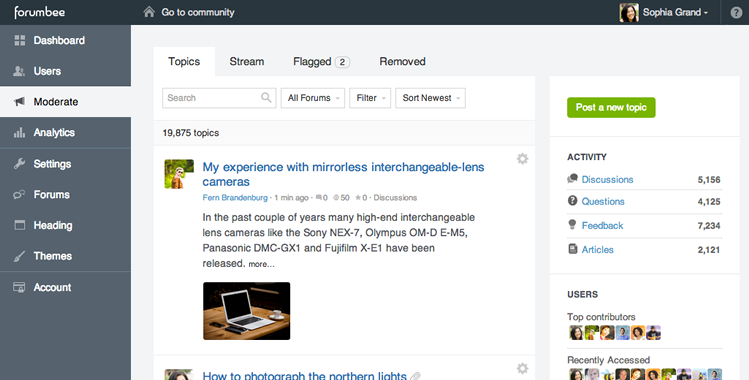 Click through to view threads in the community. We are hosted on industry-leading Amazon Web Services cloud infrastructure, which has an annual uptime percentage of at least 99.95%. Our servers scale up as demand increases, ensuring your community will remain responsive during spikes of activity.